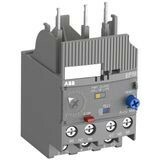 3 poles electronic overload relay. 85 millimiters height x 59.3 millimiters depth x 44.4 millimiters width. Rated operational current 2.7 amperes.